If you’re looking to make a statement or feel a little taller, there’s nothing better than a platform shoe. They’ve been around for centuries and although individual styles and fashions have adapted the way they’re worn, they are still popular today. There are plenty of platform styles that are the height of fashion in 2016, so if you haven’t got a platform in sight in your wardrobe, now is the time to change that! 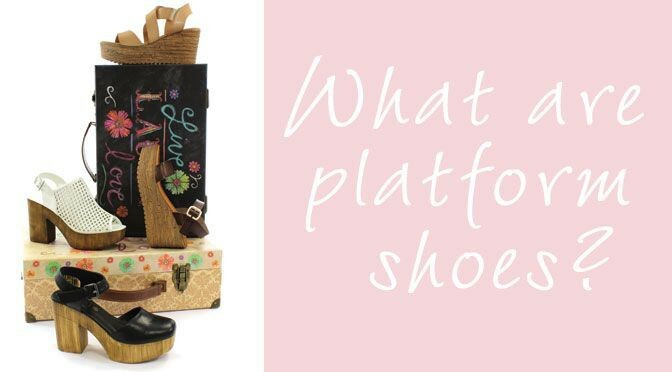 Platform shoes are shoes of any type, trainers, heels or sandals, with a thicker than usual sole. Generally, the larger than normal sole will be between one and four inches. They can have high heels but platform shoes without heels are entirely possible, as the defining area is the sole underneath the toe box. It’s the thickness here that tells you whether a shoe is classed as a platform or not. Shoes are known as hidden platforms when the upper material covers the platform, creating the illusion that there is no platform there. This makes the heels look higher and can add height without the obvious appearance of wearing a platform shoe. The height of platforms can vary widely, but the standard is between 3-10cm or 1-4 inches. However, platform footwear with high heels has been known to reach heights of 8 inches tall under the toe box and 16 inches for the heel. It’s difficult to define who invented platform shoes as they date as far back as the 16th century, and perhaps were even seen further back in the theatres of ancient Greece. In modern history, platforms really made their mark on the UK, Europe and the USA in the 1960s, 70s and 80s. Platform shoes were popular from the late 1960s into the 1970s as the ‘disco’ era began. Their main purpose was to attract attention, but they became so popular that many ordinary people wore a 1 – 2 inch platform on a regular basis. Clothing of the 70s represented release, freedom and showing off, and the platform added to this by providing an edge of theatre and fantasy. High, flat platform styles made a resurgence in the 1990s thanks to the Spice Girls who wore them as a symbol of ‘girl power’, and today heeled platforms are still a popular look for women. It’s easy to make a statement with such tall, striking footwear, so it can be difficult to know what to wear platform shoes with, and when to wear them. Platforms are in fashion but you need to know how to style platform shoes for today. It’s far from the styles of the 70’s and even the 90’s. Today platforms are subtler, and sexier! A ladies high heel platform shoe can be the ideal item to lengthen your legs, give extra height and make an impact for an evening out. Team these platform shoes with dresses or a skirt to show them off and make sure your legs look super long! In summer, platform sandals with a heel or wedge can provide the perfect all day style. Create a boho, 70s throwback look with prints and loose clothing to stay cool and look great. Pool sliders are a popular sandal style this summer, and they often have a flat, gripped, low platform sole. They’re ideal for wearing with pool or sportswear, offering a really versatile and casual way to incorporate platforms into your wardrobe. If you’re looking for platform shoes for winter, try a chunky boot. Whether you prefer ankle boots, calf boots or even knee high, platforms are a great option. Team platform ankle boots with your chunky knits and jeans for a relaxed feel that will carry you through the colder months of the year. The raised sole will help keep your clothes away from mud and wet ground too, which makes platforms the ideal choice for the winter weather. If you prefer knee high platform boots, try matching with a skirt and tights to draw more attention to your feet. Feel stylish in a mini skirt knowing your boots make a statement, and layer up with a leather jacket and a cosy scarf. There’s a platform for every season! As platform shoes can be very high, many people worry about whether they will be comfortable to wear. The truth is, they can actually be a much more comfortable way to add height than a standard heel. Flat platform shoes are often on the chunkier side and so they usually have a wide toe box which is extremely comfortable. These are the best platform shoes for wide feet. Heeled platforms can also offer comfort, as the raised toe area helps to distribute the weight more evenly across the foot than standard high heels. As with all shoes, the key to comfort is fit. This will be influenced by how well the size and shape of the toe box matches your foot, the difference in height between the heel and the ball of the foot, and the overall shape of the shoe in relation to your feet. It’s always useful to try shoes on before you buy to check the fit for yourself. Try to do this later in the day as feet usually swell as the day goes on. As you might expect, if you’re planning to wear your shoes for a long time, lower platforms are better for your feet. High heeled platforms can put a lot of pressure on the ball of the foot which can cause discomfort. Platform styles also tend to be quite rigid and don’t allow your feet to move and bend as usual. Lower heeled or flat platforms will help lessen the pressure on the ball of the foot, but will still hold the foot in quite a rigid position. If you haven’t worn platform shoes before, you might be wondering how to walk in them. The best approach is to focus on keeping a good posture and transferring the weight from heel to toe as you take a step. It might also be helpful to take slightly shorter steps than usual and walk a little slower. If you’re not sure, practice wearing them at home a few times before you step outside in them! Stand tall in your platforms; you know you want to give them a try!